Book Club offers up a boatload of veteran Oscar winners and nominees, but limps to its final chapter as a ninety minute catch-22. So many roles for senior stars: good! What this movie makes of those roles: not so much. 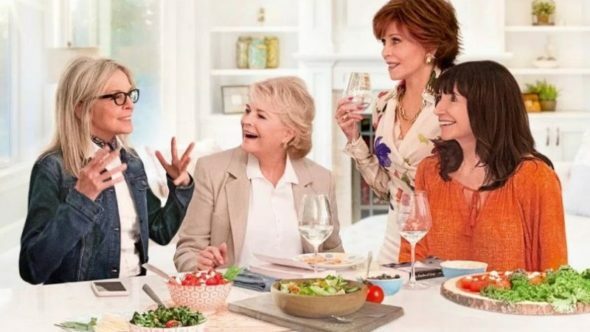 Diane Keaton, Jane Fonda, Candice Bergen and Mary Steenburgen are Diane, Vivian, Sharon, and Carol, lifelong friends who began a monthly book club back in the 70s with the scandalous Fear of Flying. With all four friends now comfortable in their golden years, the randy Vivian chooses Fifty Shades of Grey as the group’s next assignment. The girls are a bit hesitant at first but right on cue, Christian and Anna’s naughty romps reignite some fires down below. Laughing at older people being sexual is beyond lazy, it’s ignorant. Thankfully director/co-writer Bill Holderman, in his debut feature, does seem actually interested in laughing more with his stars than at them. But too many of those laughs are leftovers from every episode of Three’s Company, when Mr. Roper overhears Jack and Chrissy in the bedroom saying something like “It’s not big enough!” while we know they were just trying to hang a curtain rod the whole time! Ribaldry! While the ladies juggle possible boyfriends (Richard Dreyfuss, Andy Garcia, Don Johnson) and a disinterested husband (Craig T. Nelson), contrived antics and double entendres go straight to the unfunny bone. If you were checking off boxes, all the rich, white characters and romantic fantasies would seem like Nancy Meyers material. But Book Club can’t dig any more than surface deep, and even with all this talent, it never shows the confidence in character that elevates Meyers’s best (It’s Complicated, Something’s Gotta Give). And then, a surprisingly subtle metaphor built around the comeback of vinyl albums gives you reason to believe Holderman’s heart is in the right place here, he’s just in over his head.